BBC NEWS | UK | UK Politics | Will election campaign online be policed? Will election campaign online be policed? Another morning and a slew of press releases drop into the e-mail box from the Liberal Democrats, reacting to various government announcements. The Conservatives, meanwhile, have sent out another e-mail giving details of events at their upcoming party conference. What do the two have in the common? But if you read down to the bottom of both messages, you will be told that each has been printed and published by a named individual on behalf of the party concerned. Each also tells you that the individual and the party are based at a given address, in effect the party's HQ. Since 1983, all election candidates have been required by law to provide certain information - known as an imprint - on unsolicited campaign literature to alert voters to who it comes from. 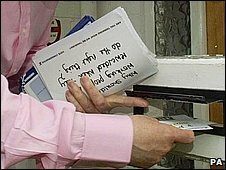 Leaflets pushed through a letterbox have to identify who has printed the material - normally a candidate's agent or assistant - who has published it - normally the candidate - and a postal address where they can be contacted. This is designed to help voters tell the material is genuine and enable them to complain about it if they want. The rules were updated in 2000 to cover material sent out by political parties as well as candidates and anyone breaching them faces a potential £5,000 fine. But with a general election on the horizon, there are concerns that the laws are ill-equipped for the new digital battlefields that the campaign will be fought on. Candidates will be using all means at their disposal to get their faces known and messages across, including text messages, social networking sites, campaign videos and internet ads, not to mention the political classes' latest communication fad - Twitter. Current laws give ministers the power, subject to Parliamentary approval, to draw up specific rules for non-printed material but, nine years on, they have yet to do so. In its most recent guidance, the Electoral Commission said candidates should as "a matter of good practice" include imprint details on their campaign websites. But candidates are not required to do so and the watchdog advised ministers in 2003 to look at the issue, arguing candidates need to be equally accountable in all different mediums. 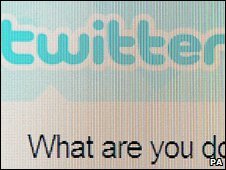 Do you need party details on tweets? While all mainstream parties and many candidates already do this, the Commission admits the practice is not "consistent" among all campaigners. "We believe that this requirement should be applied consistently across all non-broadcast media if voters are to maintain trust in online campaign material and the current generally positive relationship between voters and campaigners online is to continue," it says. With electronic campaigning set to play a bigger role than ever before in the next election, some people are worried about this apparent discrepancy. "Ministers have been chugging along either unaware that there is a risk building up or being vaguely aware of it and keeping their fingers crossed," says Mark Pack, a former Lib Dem executive who co-wrote the party's election law manual. Although there has yet to be a serious breach of the rules Mr Pack believes this may be only a matter of time and there is uncertainty about how the law would be interpreted in such a case. 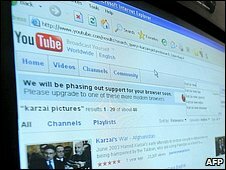 Citing a case in the US where the authorities in Florida have banned political adverts on Google because there is not enough room to display the imprints, he says there are potential "flashpoints" around the corner. "Anyone can put something on the internet, send a text message or an e-mail as the bar to action is so low," he says. Those potentially falling foul of the rules could range from "over-enthusiastic" campaigners to those mounting "dishonest" attacks and misrepresenting opponents' views. "It is not out of the question you are going to get some foolishness and the more you can protect people from this the better for everyone." Yet the idea that every electioneering text message or tweet should carry an imprint from its sender seems implausible. With space at a premium in these missives, the Electoral Commission acknowledges it would be "counter-productive" if such details squeezed out the actual content of a message. There is also the issue of where an imprint should appear on a social networking page or a YouTube video to ensure voters can see it or whether a prominent link to an official website is enough. Ministers recognised the complexity of these issues in 2004 when they decided the ever-changing media landscape meant it was impractical to create laws which would be effective and lasting. Five years on, it appears little has changed. The Ministry of Justice says specific guidance for candidates is a matter for the Electoral Commission while pointing out there is "already legislation which specifies that unsolicited material must contain details of its printer and promoter". But critics like Mark Pack have urged ministers and watchdogs to end what he calls their "stand-off" and bring rules for digital communications into line with those for printed material. "I think they have essentially let it drift because there has not been a case come up which has made everyone think we must do something about it," he says. Since 2005 the internet has grown hugely, with rising numbers of bloggers and social network sites - which all means that regulators will face new challenges such as the growing scope for dirty tricks in cyberspace. Back in 2003, the Electoral Commission said spoof websites were an acceptable part of the democratic debate as long as they were clearly identifiable as such and did not seek to deceive the voters. But now spoof videos can be seen by millions of people within a matter of minutes, do the same judgements still apply? The answer is, come the next election, the watchdog will not be spending its time scouring the internet for potential "video nasties". A spokesman explains: "There is nothing in electoral legislation that would cover that kind of stuff. Our job is to provide guidance for those people taking part in an election and to help them stay within the law." But he makes clear that complaints about potentially defamatory material, under electoral laws, remain a matter for the police and that cases will be investigated.